The Child was on a school trip this week, leaving me on my own. Although it feels like I should have taken the opportunity to go on a trip somewhere myself, the truth of the matter is, there isn’t anywhere in particular I want to go. Or at least, there isn’t anywhere in particular I want to go that I can get to and from in between the times I need to deliver her at and retrieve her from the airport. But having one’s house to oneself is a sort of vacation, especially when one suddenly has more time, fewer schedules. For example, there’s no one to drive to school in the morning, so I can wake up a little later – or I could have, had The Child not forgotten there was a time difference and called at 5am, urgently needing a document emailed to her. I should have minded, but it was nice to be needed, just for a moment: A moment isn’t the same as all the time. The rest of the time was my own; I came and went on my own schedule, and ate and cooked as I pleased. Left to my own devices, with no one to please but myself, I cooked a couple of meals, a stir-fried dinner of sausage and vegetables, and a lunch salad of leftover chicken, grilled bread, and fresh spinach that was pretty tasty. But mostly, I didn’t feel like cooking, and preferred a big hunk of crusty bread with lots of butter, and a side of fresh berries. Simple, satisfying. One of the leftovers I had was this lovely focaccia bread that I made before The Child left. It’s from Samantha Seneviratne’s upcoming cookbook, The New Sugar and Spice , which is available in the UK, while the US edition will be available this fall and can be pre-ordered on Amazon. I was lucky to receive an advance copy for review purposes, and it’s one of the nicer baking books I’ve seen recently: Recipes are organized by type of spice used in the recipes (Cinnamon, Cardamom), with each section introduced with an essay that is a little bit of personal reminiscence, and a lot more history of the spice, how it is used, its origins. The recipe is in the cinnamon section, but since I love the combination on blueberries with lemon, I swapped out the cinnamon for some grated lemon zest. 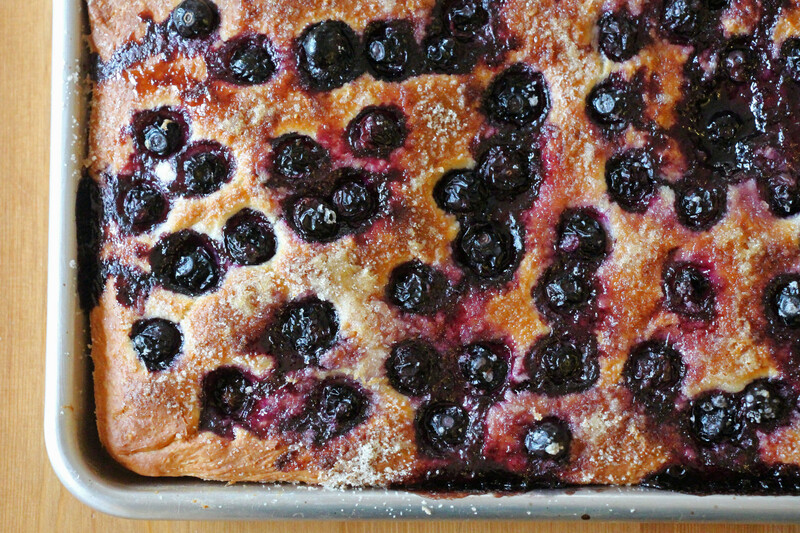 It’s a very simple, forgiving recipe – you can use any kind of berry, or use the cinnamon, or maybe some vanilla sugar – whatever you want to top it with would probably work. I got a little impatient during the last rise, so I probably didn’t let it rise enough, but it was still light and tasty – and definitely bread, not cake, which is just as well, because it doesn’t need any more sweetness with all the juicy berries and sweet, crunchy sugar crust on top. It’s a lovely way to start the day, especially a warm, lazy day, when you have no particular place you need to be except right where you are. In the bowl of a stand mixer fitted with the paddle attachment, combine the flours, ¼ cup of the sugar, the yeast, and the salt. In a small bowl, combine the warm water, ¼ cup of the melted butter, and the egg. Turn mixer on low speed, add the water mixture, and mix until a dough starts to form. Switch to the dough hook, and use it to knead the dough about five minutes, until smooth and elastic. The dough should still be somewhat sticky; this is fine. Butter a large bowl. Form the dough into a ball and place it into the bowl, covered with plastic wrap. Set the bowl in a warm place until it doubles in size. Remove the dough from the bowl onto a buttered work surface, and knead it several times, then put it back in the bowl until it has doubled again. Spread two tablespoons of the remaining melted butter in the bottom of a jelly-roll pan. Tip the dough into the pan, then use your fingers to stretch it out to fill the pan. Set the dough aside to rise (yes, again), until it is higher than the pan sides. In a small bowl, combine the remaining ¼ cup of sugar with the lemon zest. When the dough has finished rising, heat over to 450 degrees. While you wait for the oven to heat, use your fingers to poke small dimples all over the dough surface. Then, spread the remaining melted butter all over the top. Sprinkle half the lemon-sugar mixture on top of the butter, then scatter the berries over the sugar. Sprinkle the remaining sugar mixture on top of the berries. Bake until it's a delightful shade of brown and completely set, even under the berries, about 25 minutes. Let cool slightly in the pan, then move to a cutting board, cut into pieces, and enjoy while still warm. For whatever reason, some things are doomed to failure, and no matter how hard one tries, all the effort expended to prevent that outcome ends up being a waste of time, or money, or energy, or in the case of the Mini, a waste of all three. This is not unlike a manuscript that was recently sent to me by my good friend Toby over at Plate Fodder – A Taste For Italian: Celebrating Italy’s Cuisine, Music and Language. The title is the first clue that all is not right here; I’ve managed to get past the irritating lack of an Oxford Comma, but not the fact that it sounds like the author has a hankering to eat the country’s people, rather than its food. A bit of back story: A Taste For Italian is a unpublished manuscript that was found in an antique store (like a lot of things related to this book, we’re using terms loosely) by the lovely Julie over at Cookbook Fetish. The manuscript is described by its authors as “preliminary,” and that’s a good word. Julie sent the manuscript over to Toby, who described it as “uninspired,” also a good word. Toby then sent the manuscript over to me, and rather than try to sum it up in one word, I chose my Mini as a metaphor: A lot of time and effort went in, but in the end, it came to naught. It’s the car that everyone trades in. The manuscript, such as it is, isn’t really a cookbook, or a travelogue, or a cultural history, or an appreciation of things Italian. Unfortunately, it tries to be all of these things, at once, and the result is a stream-of-consciousness hodge-podge of opera snippets and history (Aida was first performed in Cairo in 1871, and one song has “virtually become the National Anthem of Egypt”), Berlitz-style helpful phrases (“Is the pizza ready? I’m dying of hunger!”), and restaurant listings (in case you happen to be in Bologna in 1997). Julie and Toby each cooked a recipe or two from the manuscript, but I didn’t even get that far, though it wasn’t for lack of effort. I got stuck on a recipe for The Child’s favorite soup, minestrone – it seemed like a fairly safe bet because, at the end of the day, how do you screw up soup? Don’t list the ingredients in the order in which they will be used, or in any particular order whatsoever. Be nonspecific about your ingredients: If you don’t care whether the kidney beans are canned or dried, your reader surely won’t wonder which to use. If you construct your recipe this way, your reader won’t be able to guess which type of beans to be using or at what point said beans should be added to the pot. They will, however, go back over the out-of-order list repeatedly in an attempt to figure out what else was omitted (the answer is the first ingredient, potatoes). They’ll have to check things off because the list order doesn’t correspond to the steps or any other sequence; in doing so, they will discover that a couple of ingredients are added twice (garlic and onion). Then they will get tired of trying to sort it all out, and will open a can of Progresso for The Child. I still had the challenge of making something inspired by the manuscript, so I went with focaccia, inspired less by the manuscript and more by Toby’s take on focaccia, but also my recent success with the Saltie cookbook. Saltie is a Brooklyn sandwich shop, which uses focaccia in most of its offerings. 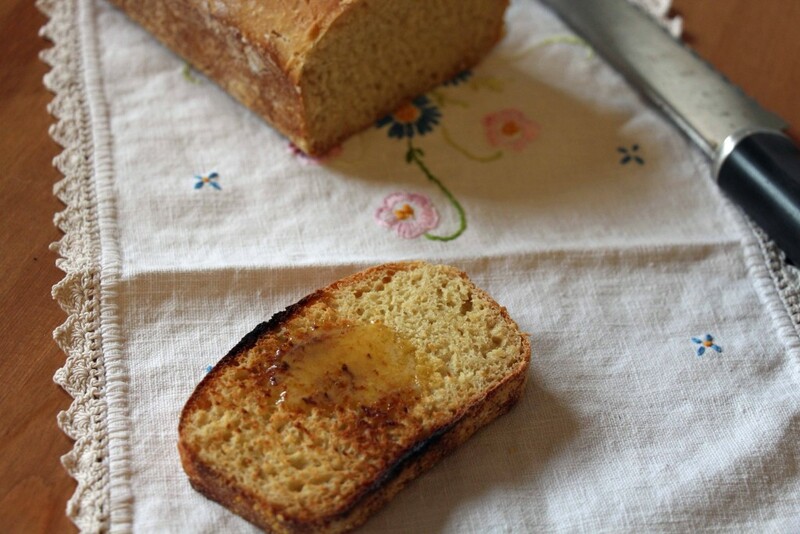 I made the recipe twice, and had no trouble following it, and better yet, The Child loved this simple bread with lots of salt. The recipe would easily make 6-8 sandwiches, maybe more, but she just cut large hunks of it and ate them plain. The downside of a recipe that makes this much is that some is likely to go bad, since it’s only good for about 24 hours. On the other hand, the cookbook suggests that day-old focaccia is wonderful added to soup, and if I can find a recipe for minestrone that uses all its ingredients, I might just make some. I did find the focaccia made absolutely superb sandwiches, and I tried one of the recipes from the book, the “Ship’s Biscuit”. This blissfully simple sandwich relies on the freshness of one ingredient – use only fresh ricotta cheese, not that packaged supermarket stuff – and the technique used with the other ingredient – the eggs, which should be “softly scrambled.” It took a while for me to master the technique, which is basically this: melt some butter in a frying pan, then crack two eggs into the warm (not hot) pan. When the whites begins to set, start moving them around the pan with a small rubber spatula but don’t break the yolks until the whites are completely cooked and fluffed up. Then, take the pan off the heat, break the yolks, stirring them in with the whites while letting them cook over the residual heat. You may have to play with this a couple of times to get it right, but when you do, you’ll know – the eggs will be fluffy, yet with a nice softness of yolk. 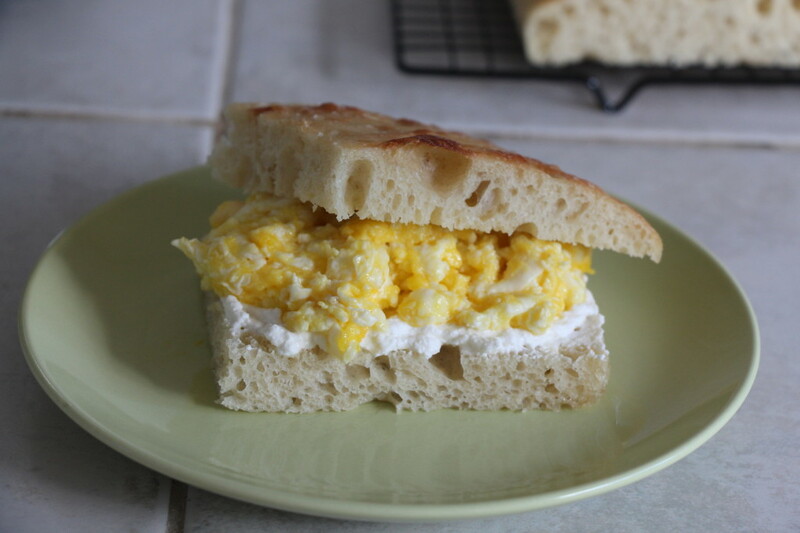 To make the sandwich, take a piece of the focaccia, slice open for a sandwich, spread some fresh ricotta on the bottom half, and the soft-scrambled eggs on top. 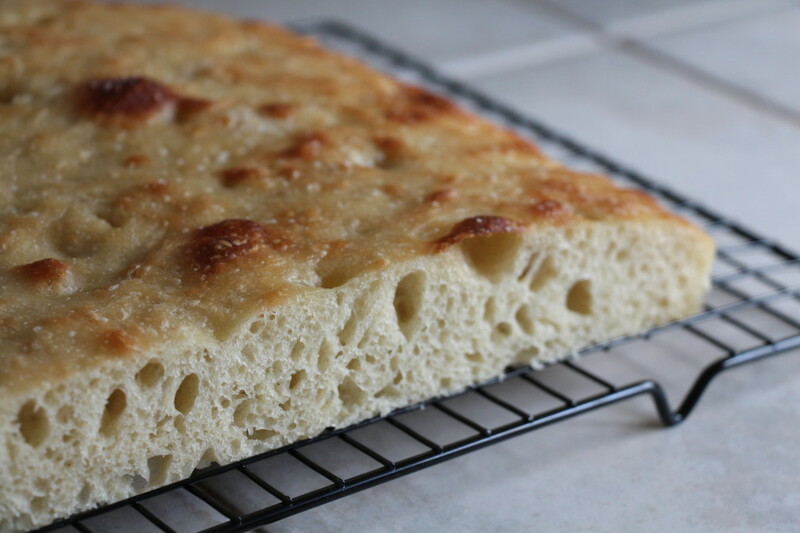 Then scarf it down and be amazed by the creamy, eggy texture against the salty, oily focaccia. I’m thankful to Julie and Toby for letting me share the fun with A Taste For Italian. If you’d like the information on how to join in, or just what the heck is going on, it’s here. I am eagerly awaiting my instructions on where the manuscript will head next! In a large bowl, whisk together the flour, salt, and yeast. Add the warm water to the flour mixture and stir with a wooden spoon until all the flour is incorporated and a sticky dough forms (no need to knead). Pour the ¼ cup olive oil into a 6-quart plastic food container with a tight-fitting lid (see Note). Transfer the focaccia dough to the plastic container, turn to coat, and cover tightly. Place in the refrigerator to rise for at least 8 hours or for up to 2 days. Preheat the oven to 450°F. Bake, rotating once front to back, until the top is uniformly golden brown, about 15 minutes. Transfer to a wire rack to cool, then slide out of the pan. Use the same day.